Pathology has long been targeted as an area ripe for digitalisation and is commonly discussed as the next big opportunity in clinical IT. Cut through the hype and explosive growth predictions though and a different story is evident. Adoption to date has been slow, regionalised and challenging, forcing some high-profile health technology vendors to write off investments in the sector. So is digital pathology really going to go mainstream and live up to the hype? Or will it continue to frustrate those looking for a new growth sector in clinical IT? As we near the end of our in-depth research on the global digital pathology market, we discuss the outlook for the market, recent progress, and why we think digital pathology is starting to gain momentum. Focus on providing value-based care, a response to spiralling health spending and large-scale health reform, has increasingly pushed health providers to tackle operational and clinical inefficiencies. Many believe technology has a significant hand to play in this process. At its core, pathology has changed little in over a century; pathologists still commonly use light microscopes to review specimens on glass slides, manually interpreting and reporting on what they see. Slides are also commonly mailed between health providers for second opinions and must be physically stored for long periods, requiring extensive space and driving substantial real estate costs at high volume sites. This “hard-copy” approach in the context of the increasingly digital healthcare environment is today viewed as both inefficient and dated. Few providers however have moved to a fully digital pathology working practice yet, with less than five percent of pathology sites adopting a fully digitalised workflow for primary diagnosis globally. There are numerous reasons why adoption has been slow, though recently some significant progress has been made. The most common challenges are outlined in the table below. Pathology is a complex and diverse sector, with ties to many different clinical and research sectors. Market development has therefore not been linear, creating a fragmented competitive landscape. We can categorise vendors broadly into subsets, including digital pathology specialists, life-science vendors, clinical IT software vendors, scanner hardware vendors, lab information systems (LIS) vendors, image analysis specialist and machine learning specialists. Few of these offer “full stack” solutions, so often a provider must attempt to assemble a combination of products, creating interoperability issues and a need for customisation. Alternatively, some have opted for “closed-loop” systems instead, usually tied to the scanner hardware, thereby creating digital pathology images in a proprietary format and limiting wider interoperability. Both require significant investment of resources and trade-offs between integration within the pathology lab and broader interoperability in the wider health system. The market today is mostly made up of new implementations installed within the last few years, especially in the USA where approval for primary diagnostic use was announced just last year (Philips Healthcare Intellisite Pathology). This means there has been little time to asses their success or increase confidence in the technology. It will therefore take some time for return-on-investment (ROI) analysis and anecdotal guidance from early adopters to filter through to other providers that are yet to move to digital pathology. Digital Pathology has infiltrated health providers in mature economies in other ways other than digital primary diagnosis. 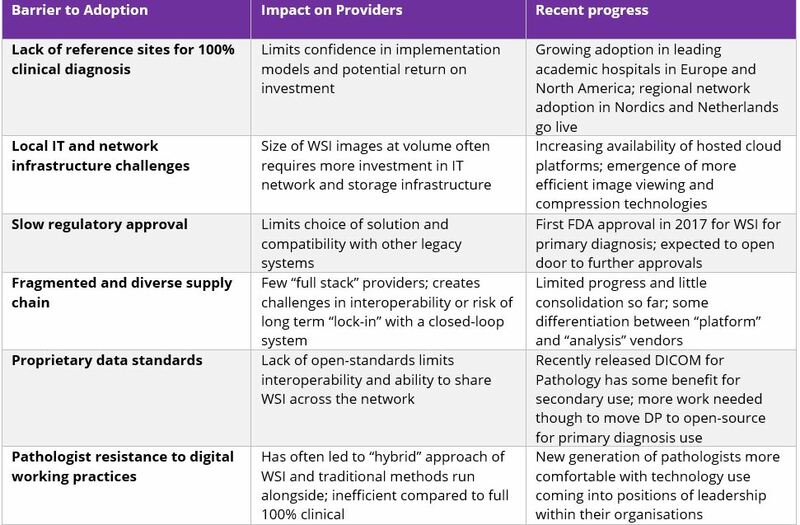 Some providers have taken a step-wise approach to digitalisation of their pathology services (see scale below). Digital pathology technology to support secondary uses is more commonplace than for primary diagnosis; it is often rolled out on a smaller scale for clinical review, medical education or remote consultations and telepathology for specialist cases. While these “Level 1” use cases only cover a small proportion of total diagnostic volume for pathological service, they do serve a purpose in helping providers and pathologists to familiarise themselves with digital technology before going fully digital. They have also helped providers to better understand the challenges associated with transitioning to digital pathology, enabling them to prepare better for future implementations. In the short-term, we expect this trend to continue, with more providers deploying digital technology for “Level 1” uses, before fully implementing for primary diagnosis. It should also be noted that the growth of enterprise imaging is having an impact here, with provider focus on enabling imaging and other clinical content to be made available across health networks. While this can add further confusion to procurement decision-making and whether to expand existing clinical archives and clinical viewers into pathology to support multidisciplinary teams, this influence can only be a positive sign for longer term investment in full-digital pathology digitalisation. It is important also to not overlook the future direction of care provision and the influence of allied sectors when assessing the future of digital pathology. Pathology is in many ways facing the same challenges as are being observed in radiology today; increasing image volume, declining numbers of specialist physicians, demand for improved quality of diagnosis and a push to more closely integrated with other care teams. However, radiology has had a significant head-start, in that digital Picture Archiving and Communication Systems (PACS) and Radiology Information Systems (RIS) have been in use for two decades. This has enabled providers to start using analytics to track operational efficiency more easily. Moreover, vendors and providers are working on augmenting radiologists via specialist workflow tools with contextual information from the patient record to help support improved diagnosis. At its current level of digital maturity, attempting the same for pathology would be impossible today. Radiology imaging has also emerged as a prime candidate for application of artificial intelligence (AI), especially for pattern recognition and quantitative measurement. While still early in development, it has garnered substantial investment and industry interest, evident in our reports on this market. Pathology is also an excellent candidate for AI, especially for labour intensive tasks such as histologic cell counts; automation of these processes would have significant resource benefits. However, the development of AI for pathology requires large sets of structured digital WSI to train AI-based algorithms. Given the current low adoption of digital pathology globally and lack of universal standards, it will be impossible for AI to be adopted for widespread use anytime soon, unless the speed of digital pathology adoption increases significantly in the near term. It’s clear then that digital pathology holds significant promise as a new sector for clinical IT. However, it remains a long way behind many other clinical departments in its adoption of technology. While some progress has been made in addressing many of the issues and complexities associated with pathological services, further progress still is needed for market growth to match the marketing hype. With healthcare provision evolving towards value-based, multidisciplinary care, focus on operational efficiency will intensify focus on pathology digitalisation, though more established models of implementation are still needed. Moreover, growing use of analytics and machine learning in other segments should further spur a transition to digital pathology. The question for many providers is therefore changing; its no longer a matter of “if” for digital pathology, but “when”. Signify Research is an independent supplier of market intelligence and consultancy to the global healthcare technology industry. Our major coverage areas are Healthcare IT, Medical Imaging and Digital Health. Our clients include technology vendors, healthcare providers and payers, management consultants and investors. Signify Research is headquartered in Cranfield, UK. This report provides a detailed, data-centric analysis of the market for Digital Pathology. Features include market estimates for 2015 – 2017, annual growth forecasts for 2018 – 2022 and market share analyses.